Artist's concept of the Voyager spacecraft. A second man-made object is lurching into interstellar space. Voyager 2 is now outside of the heliosphere -- the magnetic field created by the sun, according to NASA. The robotic spaceship is more than 11 billion miles, or 18 billion kilometers, from Earth. It follows Voyager 1, which crossed the boundary in 2012. But Voyager 2 may have more to show us. It has an instrument that will offer NASA scientists observations of interstellar space. The fact that the two probes have left the heliosphere doesn’t necessarily mean they are out of the solar system, the space agency explains. The solar system’s boundary is far out -- beyond the outer edge of the Oort Cloud, a collection of small objects influenced by the sun’s gravity. Voyager 2 launched in 1977, 16 days before Voyager 1. The original mission was to conduct studies of Jupiter and Saturn. 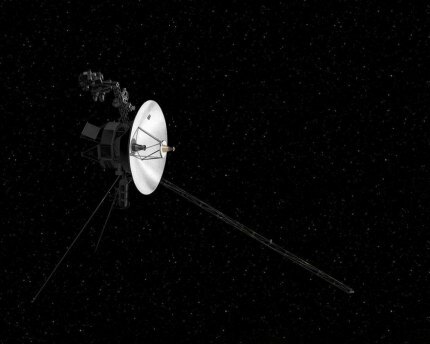 After 41 years, Voyager 2 is NASA’s longest running mission. Water molecules found on asteroid: The findings keep coming from a mission to investigate the asteroid Bennu. From August through early December, the OSIRIS-REx spacecraft aimed three instruments toward the asteroid. That research revealed the presence of molecules containing oxygen and hydrogen atoms bonded together, known as "hydroxyls." “The team suspects that these hydroxyl groups exist globally across the asteroid in water-bearing clay minerals, meaning that at some point, the rocky material interacted with water,” concludes the University of Arizona. While the asteroid is too small to have hosted liquid water, its parent body -- a much larger asteroid -- could have contained water at some time. Like us on Facebook and tell us what you think.